Jill's World of Research, Reaction and Millinery: Moose on the loose! So there I was, happily spending an entire Saturday outdoors taking pictures in the crisp fall weather. I had spent time up in East Canyon, and was now coming back down from Lambs Canyon. A handy wide spot near the canyon entrance allowed me to pull over and get some final shots of the area. As is my personal outdoors/all alone policy, I was just a few feet away from my car, and other cars were going up and down the one lane road every five minutes or so. It was Saturday after all, so leaf peeking traffic was a tad bit busier than usual on the narrow winding road. A white car passed me by, then it suddenly slowed down and came to a complete stop. I turned and walked closer to the car to check out what was going on. Funny how one's city raised brain at first says "Wow look at the big dog!" About three seconds later, the brain re-boots and delivers a more fitting report"
"Oh my goodness...it is a MOOSE!" I had been standing where the white car was stopped just moments before and sure as heck hadn't noticed any moose loping along the road then. My second thought was "I want to go stroke that beautiful fur; it looks so warm and sleek." His coat positively glowed in the sunshine. Thankfully my brain's CEO area quickly nixed that idea. And at the same time my brain rang warning bells that moose can charge people and cars out in the wild. I was beside the white car at this point and talking with the car's driver and passenger. We agreed: the moose definitely had, and always will, have the right of way. We agreed that I could follow on foot from mostly behind their car. If the moose took a dim view of us, I would have some shelter at least. Mr. Moose sauntered on down the road, pausing from time to time to look back at us over his shoulder. And yeah, we kept inching up behind him, stopping whenever he looked back. I happened to have my 60mm fixed lens on my camera so I couldn't zoom in on him. Still, that was much better than if I had had my rented wide angle lens on my camera, the lens I had just switch from to my 60mm. The wide angle would have made the moose look like a toy poodle in the distance. We followed the moose about a quarter mile down the road, to the entrance of the canyon. At this point I was getting a little concerned as not too much farther along was the entrance to the freeway. Having a moose on the freeway is never a good thing. Then pulled a sharp left and climbed straight up the side of the canyon. That's a pretty steep incline, but he disappeared up it in nothing flat. That is oh so fun! I hope he stays out of the way of hunters and the freeway! PS... you know they are wild animals...right? Glad you took cover behind the car. That's very exciting! Glad you were able to see and photograph him! I have been taught that that would have all the potential for trouble. Big old moose and wee little brain = not good. Still, he is a wonderful creature and you certainly got some amazing shots. Do they show you those charming public service announcements about moose decapitating people by flailing through their windshields. Ohhhhh it gives me shivers just thinking about it. Well, you did a fine job of capturing the 'moose on the loose'...whatever calibre your camera lens was! Beautiful. What a great moose encounter. They are such ungainly looking creatures yet remarkably graceful on the move. A moose encounter with a happy ending. 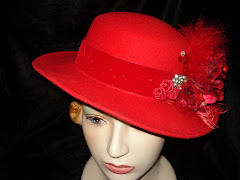 Thoughts on Life and Millinery. I'm Jill. 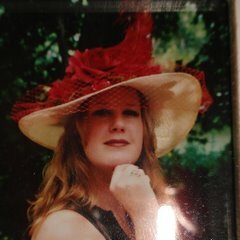 I'm a librarian and milliner now living in Salt Lake City with my husband of 37 years and my three shelter adopted cats. I'm 60, was born and expected I would spent my whole life in San Diego, save for two years in Corvallis Oregon in college. Then beginning in 1997, right after our youngest graduated from high school my husband and I began "empty nesting" on the move. We lived one year in Almenden CA (San Jose area), two years in Dallas TX and eight years on Houston TX before moving Salt Lake City in the fall of 2008. I love it here, but counting on Heaven being my ultimate hometown! I do hope we will one day be neighbors there? I have two adult children; a daughter in San Diego and a son (and daughter-in-law) who also live in Salt Lake City; two beloved grandsons, and parents who were born and still live in San Diego, and who read my blog every day. Second Snowfall of October? Oh my! ...And you gotta pray without ceasing, right? Need More Hats!